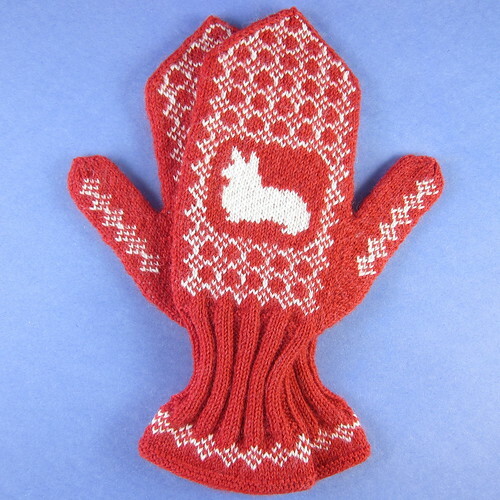 You may remember the Corgi Mittens I made earlier this year for my friend Elle. Quite a few people asked me if I could do a chart for other breeds of dogs, so yesterday I decided to play around with a few and share them with you. The most popular request was for a dachshund, so I worked on that one first. 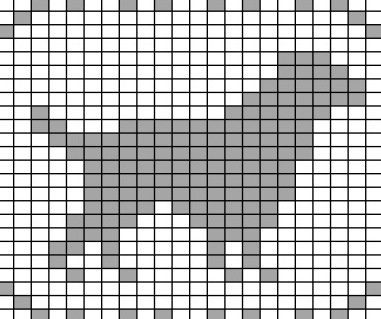 The dachshund works well for charting because it has such a distinctive shape with its long body and short legs. Then I moved on to a few other breeds including the beagle. This one was a little trickier, because I wanted to make sure to get the idea of the ear in the silhouette. I found some dogs to be really hard to do because it’s hard to get a pointed ear or muzzle. 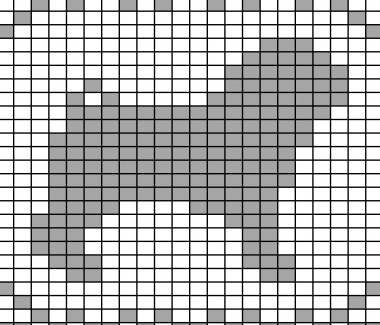 Plus, getting enough detail to make a breed recognizable at this size certainly takes a lot of trial and error. 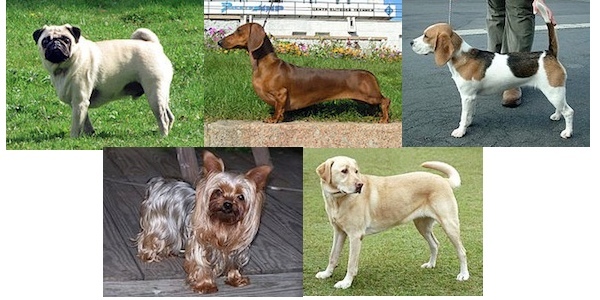 In the end, I had charts for five breeds that I was happy enough with to share with all of you. You can download the charts here (all the charts are the full hand like above). 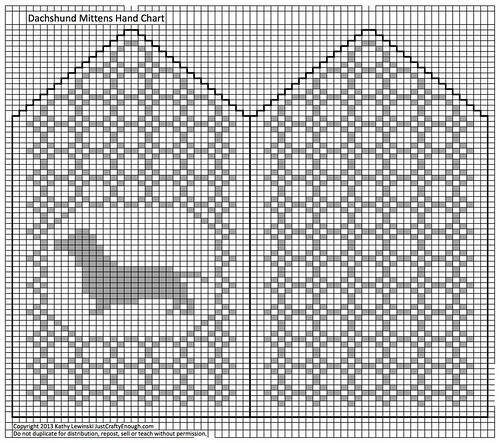 You can get the instructions for knitting the mittens, as well as the chart for the cuff and thumb, on the original post. Now, I’m sure some of you are saying, “Oh, but I want a poodle!” or cocker spaniel or some other breed. 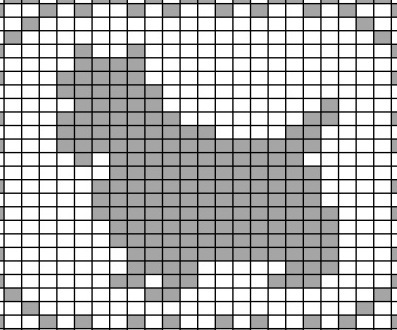 I can’t promise you that I will get to charting other breeds, but if you leave a request in the comments below, and I do do more charts, then I will take those requests into account when choosing breeds. Do not copy for distribution, repost, sell or teach without permission. Soooooo cute!!! I want pug mittens! Your mittens are so cute! 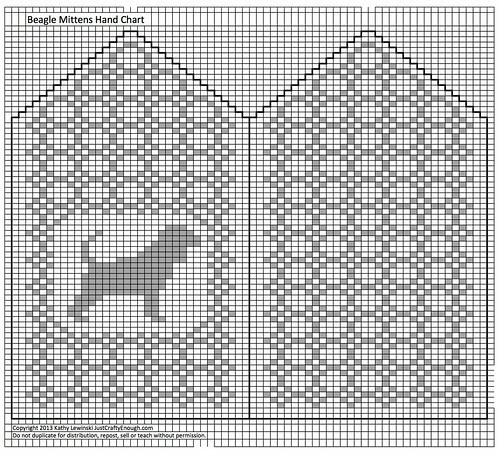 I have two doxies and would love to try out your pattern. Thank you so much for sharing your ideas and your time. even though it’s not technically a breed, Pit Bulls! Many are being rescued from shelters and their new owners are finding them to be the most loyal and love-a-bull creatures. I know this design would be popular!! I have a schnauzer, but I think I’ll just take the empty space and try my own hand at filling it. I’m certainly a good enough knitter for this kind of thing! I would love to see a Jack Russell or shih Tzu. CAN YOU DO A POODLE PLEASE? I would love to see either a Labordane or a Great Dane!